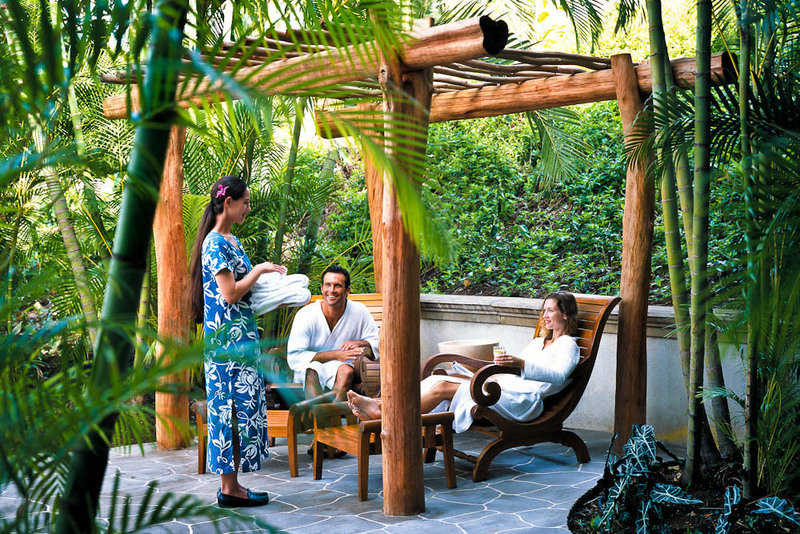 One of Hawaii's top spa resorts. Sit back and relax as Renata Provenzano reveals the five best spas across the Hawaiian Islands. Kaua‘i is considered the nurturing motherly island as it is the oldest of the archipelago. It rains a lot here so you feel cocooned in humidity and the ancient Hawaiian mana (energy) really is palpable. Anara Spa in the south of the island has huge wooden outdoor hales and lava rock shower gardens, so you can pretend, just for a few hours, this is your new home. The menu is decadent and makes the most of local ingredients and the Hawaiian tradition. The Kaua‘i clay package uses local ‘awa root (kava) to ease insomnia, which is polished over your body with coconut oil and warm stones. This is followed by a volcanic clay body mask and massage. Or what I call a body pavlova, the Organic Liliko‘i, which uses organic locally grown liliko‘i (passionfruit) mixed with citrus, mango and coconut to hydrate your skin and make you smell delicious! Waikiki’s first hotel, the Moana Surfrider, was built in 1901 and is affectionately called the First Lady of Waikiki. It is a stunning plantation-style building and has just launched the Moana Lani Spa as the only beachfront spa along famous Waikiki Beach. To start, you will be given a bowl of sea salt to place your worries, which is symbolically released into the ocean at the end of the day – a great way to start your Hawaiian holiday. Then wind down to Hawaii time with the quintessential Lomi Lomi Ola massage, which is performed by traditionally trained therapists – meaning they were trained by native Hawaiian masters of Lomi Lomi. Follow this up with the delicious Kona coffee and vanilla scrubs for the feet or the body and you won’t just feel fantastic, but smell like paradise as well. Hundreds of couples get maui’d (get it?) on Maui, but this island is also home to the biggest spa in Hawaii – Spa Grande at the Grand Wailea Resort right on Wailea Beach. With more of a European feel, you can start with a circuit of medicinal thermal baths or self-massage under the three waterfalls in the Hawaiian corner, which includes five seal salt baths – all included prior to any Spa Grande service. Unique treatments to try include volcanic ash facial; seaweed body mask; clay mask of crushed flowers; or a honey mask for your hair, straight from the busy bees on the Grand Wailea rooftop. 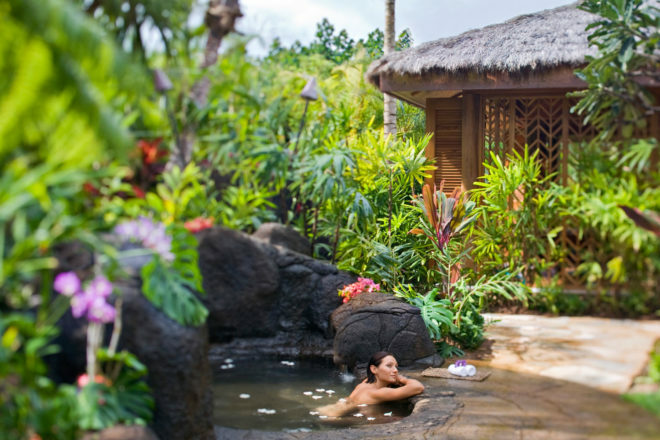 This is also the only place where you can try a six-hands lava stone massage, or a pala’au (to heal with plants) journey which uses lunar and stone-infused products such as the olivine crystal herbal elixir. Spa Grande also caters to teens and kids. Right on Pauoa Bay, the Fairmont Orchid’s The Spa Without Walls has people grinning before a treatment begins. You can stay inside, but why waste the chance to be indulged in an outdoor oceanfront hale or waterfall hale, both so close to the ocean the salty spray will tickle your skin. So inspired by the island’s nickname ‘the land of fire and ice’ – which came from its active volcano Kilauea and the snow found in places during winter – this spa is the place to try the pōhaku wela (warm lava stone therapy). The Kāne treatment offers the same but cools you down with ‘awa (ginger) cream afterwards. Or for a complete temperature reversal which is great for lymphatic drainage, iced marble stones are applied to the body to reduce inflammation for an extra $28. And if you’re peckish after a busy spa day, Fairmont caters to guests who prefer gluten free, macrobiotic, raw or vegan diets. SpaHalekulani is a pretty special place and the type of indulgence every woman deserves at least once in her life. The design is elegant – the brand new spa has the classic seven-shades-of-white used throughout the décor, which is part of Halekulani’s signature style. Some of the ‘Pacific’ options on the menu include a Polynesian Nonu (a Samoan massage using stones and noni fruit) or a Polynesian steam therapy to detox the body. But, to make a day of it, the Heavenly Journey (four hours of bliss) option allows you to choose a body treatment, a massage, plus a pre-treatment foot pounding and a facial.